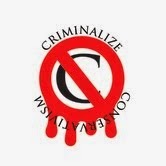 Criminalize Conservatism: What Is The Difference Between Conservatism And The GOP? What Is The Difference Between Conservatism And The GOP? ...because nothing is as American as Conservatism - Conservatism for Dummies, that is. So don't you feel blessed that you're a Republican AND a Conservative? "Wonder Why The American Right Is So Dumb? Read Fox Nation vs. Reality: The Fox News Cult Of Ignorance." "In recent weeks there have been some depressing examples of idiotic lunacy emanating from the ranks of conservative media and punditry. They include blaming gay marriage for the fall of Western civilization, accusing Hillary Clinton of being rich (which is now a bad thing), and taking anything Ted Cruz says seriously. Right-wingers still deny that Climate Change is real, despite the affirmation of 97% of scientists, but they believe that the federal government is plotting a hostile takeover of Texas and the EPA is planning to outlaw all ammunition. This does not bode well for the future of conservative politics. But there must be an explanation. "Two years ago News Corpse published a collection of articles that documented the deception, propaganda, and outright lies disseminated by the Fox News community website, Fox Nation. It was dubbed 'Fox Nation vs. Reality: The Fox News Community’s Assault On Truth.' Every chapter was fully verified by reputable sources and exposed the website for its shameful dishonesty and lack of ethics. It is that sort of concerted effort by wealthy and powerful media fabulists that cripple the intelligence of the willfully dimwitted. "Now a second volume is also available with more documented examples of Fox’s devotion to disinformation. It is titled 'Fox Nation vs. Reality: The Fox News Cult of Ignorance.' If you purchased Volume I, you will want to add this to your library. 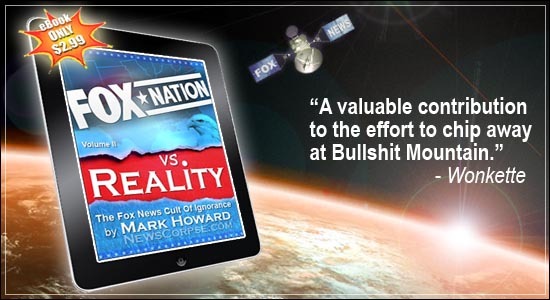 It is a great resource for proving to your Fox-deluded friends and family what a den of deceit it is. And if you didn’t buy Volume I you can get Volume II and leap right into the fantastical world of Fox, then go back and read the first volume for additional chuckling and wincing..."
...and by "love," we mean "hate." And finally, here's what those lies turn into when you're a Conservative. There's no difference between a Republican and a Conservative - they both believe in giving our money to their rich benefactors, no matter how many die in the process. In a participatory democracy, Cons have to pretend that their eyes are on abortion, "states' rights," "individual liberty," and "self-reliance," all designed to capture the hearts and minds of the idiots that they so assiduously proselytize.